Kimolos (Κίμωλος) was called "Argentiera" by the Venetians, and takes its name from the Greek word Kimolia, which means chalk. Both names recall the white rocks of the Island. And in effect, a white/silver quality of perlite is still being extracted today, along with cimolite, chalk. 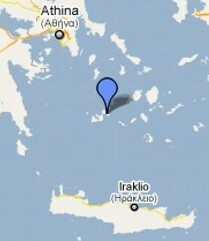 Kimolos measures 37 km2 with a perimeter of 16 miles, it is located North East of the island of Milos, separated by the strait of Kimolos, and more generally in the South/West part of the Cycladic Islands. Kimolos is a volcanic island, mountainous and full of natural caves. It counts about 650 inhabitants, mostly concentrated in the "Chora" and at the port "Psathi". South/East of the island there are three other small islands: Ag.Giorgos, Ag.Efthathios, e the larger, wonderful Poliaigos, all uninhabited. The landscape of the island presents fairly dry hills and fields, even though there are plains appearing green and where agriculture gives tasty products, thanks to its volcanic land. Typical Mediterranean flowers and trees, including large areas covered with prickly pears. The "Chorio", Kimolos town, less than 1 km. from the port, offers a full dive into the past: paved narrow streets, abandoned houses being now recovered, typical Cycladic stone- built houses, and, generally speaking, a sense of bygone days, when the island was certainly enjoying better local economic conditions. Now, little by little, old buildings are being restored, and new one are showing, both for the improved conditions and for tourism. Roads are sufficiently wide and paved to visit the most important beaches and zones. The island if full of churches, dating back to the 16th century, and we mention Panagia Odigitria (1592), Agios Ioannis Chrisostomos, Metamorfosi Sotiros, Panagia Ikonomou, etc. Lastly......the tourist planning a vacation to Kimolos is a peace lover, a philosopher, an observer, fond of simple but tasty local cuisine, flying away from traffic and modernity.